I remember the first time I saw the word ‘Sport’ on a minivan. It was a Ford Windstar that was in bright red, with sporty looking alloy wheels and a spoiler tacked onto the back. That was officially the day the word lost any meaning that equated it with performance. Since then, the word has become as misused as the Presidential Twitter account. It seems automakers were only too happy to dress up a pedestrian vehicle to make it look sporty as opposed to feel sporty. So you can imagine how much my eyes rolled when I learned I’d be getting seat time in the new ‘sport’ trim of the Elantra. But let’s stick to ‘sporty’ styling for a moment, because Hyundai did a great job with the exterior. 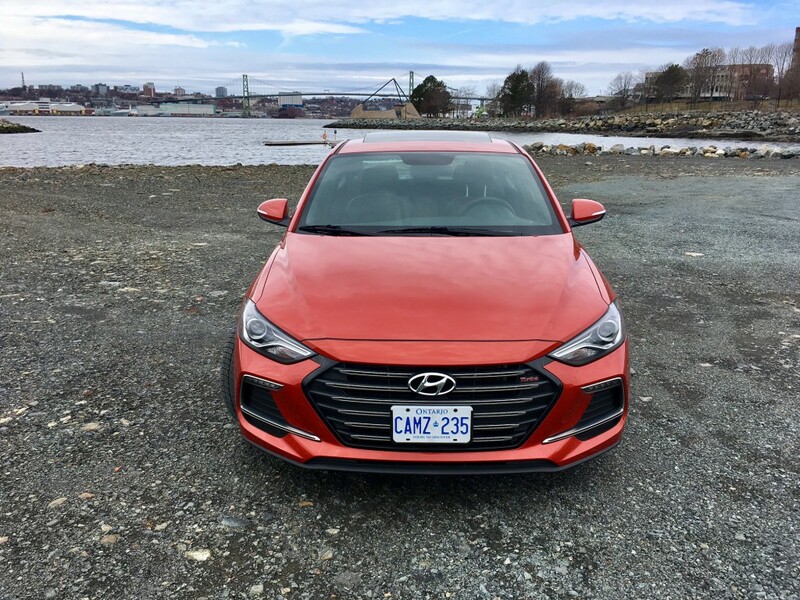 I’ve reviewed the regular Elantra before and commented that it seemed as if Hyundai had gone a bit more conservative with its styling. There is certainly nothing conservative about the Phoenix Orange paint on my tester or the standard and stunning 18-inch wheels. Otherwise, the changes to the sport are likely to go unnoticed by the average person. You’ll have to look hard to see that the Sport comes with unique headlights (HID’s are standard) horizontal LED daytime running lights, a new grille with a tiny ‘Turbo’ decal hidden inside along with a new bumper. It also gets side skirts and re-worked LED tail lights and amber lenses for the turn signals. A rear diffuser and two pipes finish off the look. It’s almost like Hyundai decided to take a page from the Germans in terms of beefing up a more mundane models with performance styling; that is to say, subtle approach. Aside from perhaps the Phoenix orange paint, the Elantra Sport doesn’t shout “LOOK AT ME” to the whole world. It’s quite content to take a less abrasive approach. 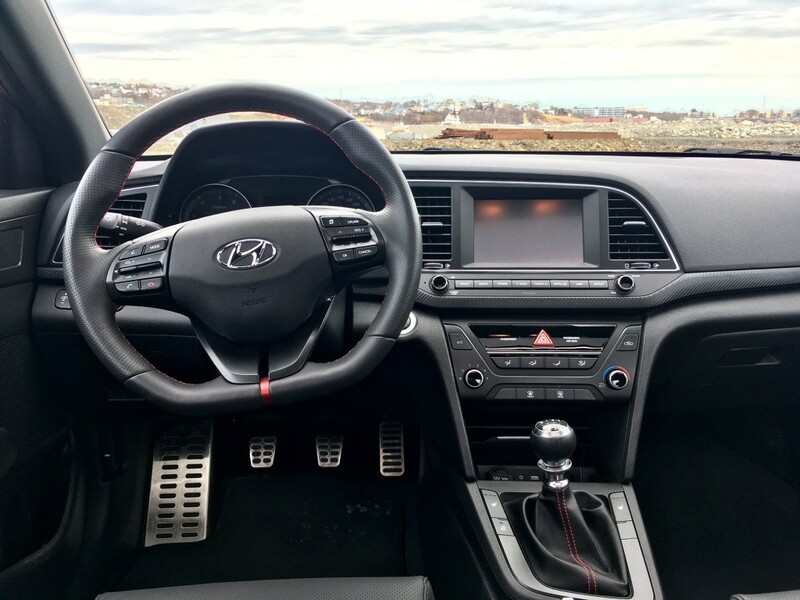 The most immediately noticeable change inside is the steering wheel design which is much nicer looking than in the regular Elantra and is flat-bottomed as well. There is also red accent stitching, black door handles and, happily, a proper manual handbrake to go along with the manual. While Hyundai could not resist the urge to embroider ‘Sport’ into both front bucket seats, I’m happy they didn’t lambaste the side bolsters with massive ‘Turbo’ emblems like they did in the Hyundai Veloster. The only thing that irritated me about the interior was the fact that the Elantra Sport is only too happy to panic about the fact that you’ve left the sunroof open, but it only let you close it unless you turn it the whole car back on again. This may seem a bit nitpicky, but trust me, it got old fast. Besides, there were plenty of times that I purposely wanted to leave the sunroof tilted open for ventilation and it would still react as if I was leaving a child behind in a hot car. Also, there were a few too many times when the keyless entry did not respond on the first try. Interior head, leg and knee room is good no matter which seat you are designated too, except perhaps the centre rear seat. But the big story here, as is the case with most Hyundais, is value. Despite my tester being the ‘base’ version of the Sport trim, it still came with leather as standard along with heated seats, a heated steering wheel, a decent size touch screen for the infotainment system, Siris satellite radio and HID headlights. Sure, there was no automatic dual zone climate controls or navigation, but those are available with the tech pack if you truly think you need it. But the fact of the matter is, the base model is the true value leader and the one to get. A 1.6 litre turbocharged four is the name of the game for the Elantra Sport. It produces 201 horsepower and 195 horsepower. This is a substantial boost in power from the run-of-the-mill Elantra which will only net you 144 horses. Power is mated to a terrific six-speed manual or a questionable seven-speed dual-clutch automatic. 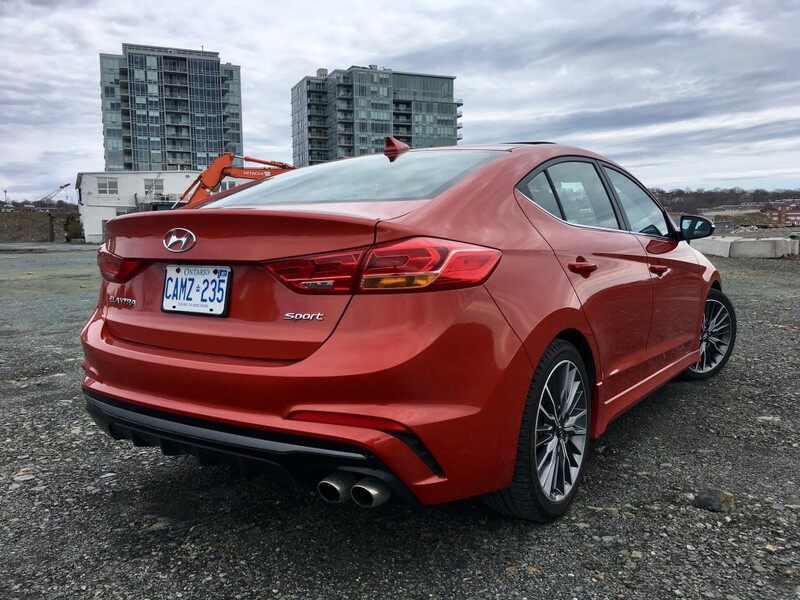 I say ‘questionable’ because if it’s anything like the dual-clutch I experienced last year in the Veloster Turbo, you’ll want to stay far away. 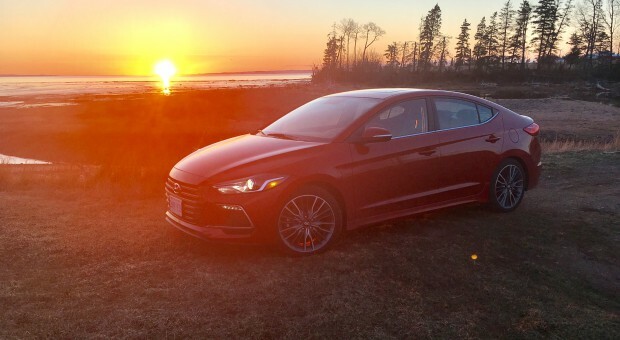 But even if it is halfway decent, there’s nothing quite like rowing your own gears, or further increasing the Elantra Sports value by saving money with the manual. Official 0-100 km/h times peg it in the mid seven second range which doesn’t seem terribly impressive on paper, but it certainly feels quicker than that in the real world. It almost encompasses the same sort of trick that the Mazda MX-5 does; which has a seemingly laughable amount of horsepower and isn’t particularly quick on paper, but when you put everything together, it works brilliantly and never fails to put a smile to your face. There’s something about revving the engine to get the most out of the torque. 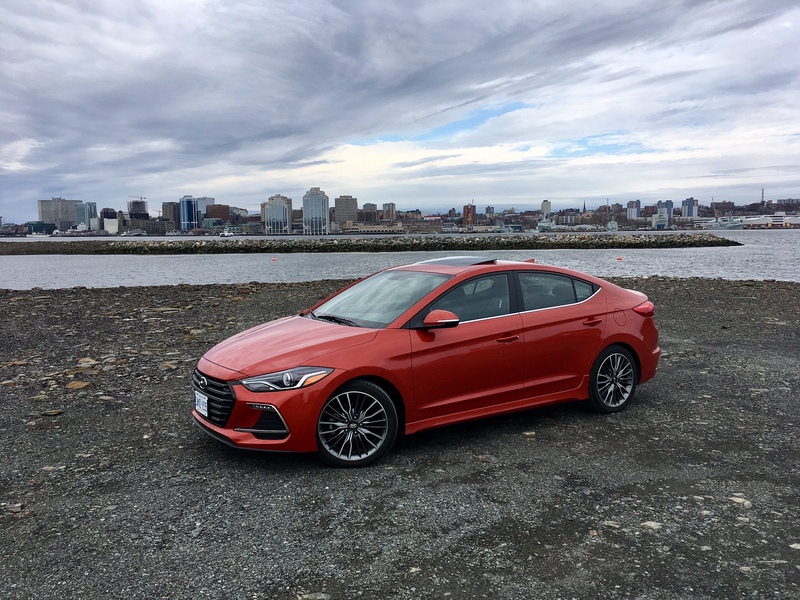 There’s something about shifting down a cog to hear the pop come from the exhaust note (which I’m told Hyundai paid particular attention to – though it can really only be heard with the windows down). 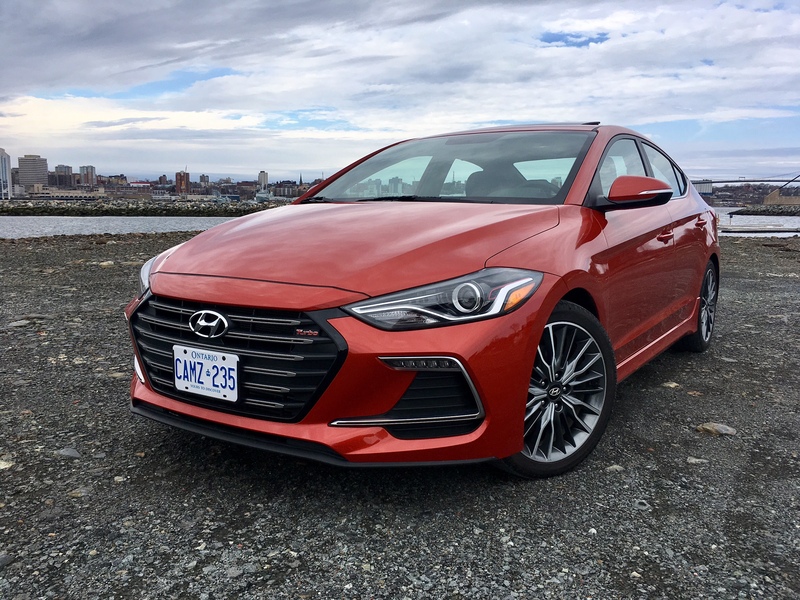 Despite the good powertrain combo, the Elantra Sport’s driving dynamics are the real story here. What impresses the most is that Hyundai didn’t just stiffen the suspension and up the power. It paid special attention to detail such as switching to a multi-link suspension, stiffer springs and shocks, quicker steering feedback and even more high strength steel. The end result? A completely competent corner carver that was only let down by the winter tires fitted to it when I pushed it hard. It cause some under steer that was still fairly manageable. I’m confident if you fit the Elantra Sport with some proper summer rubber it would do even better in the corners. And as impressive as that is, perhaps even more so is its ability to remain comfortable during every day driving. Around down, the Elantra Sport is only too happy to settle down and drive like, say, a normal Elantra would. 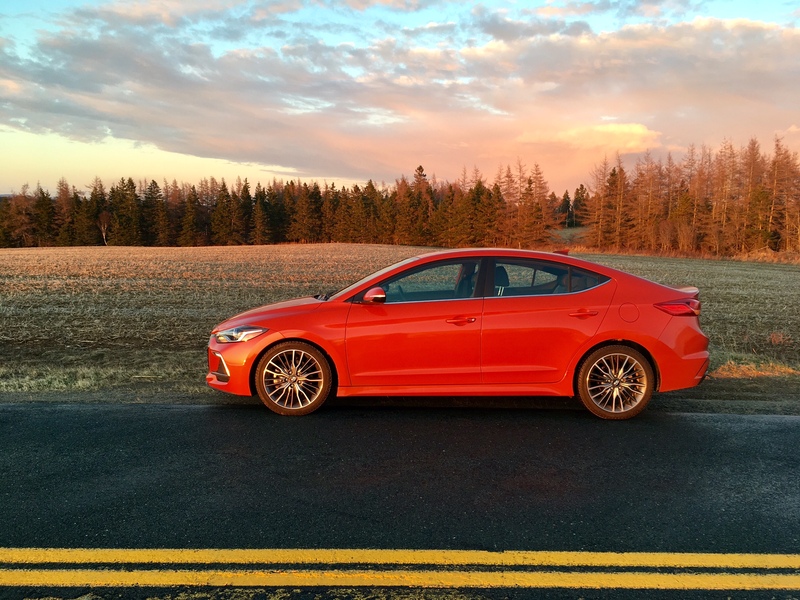 It soaks up bumps perhaps even better than the normal Elantra does; it’s quite remarkable. Officially rated at 10.7 L/100 kms city and 7.8 L/100 kms highway, I was able to beat the combined rating of 9.4 with my real world driving result of 8.8. That includes some spirited driving and is pretty much the icing on the Elantra Sport’s value driven cake, isn’t it? It’s funny. While I have the utmost respect for Hyundai being able to propel itself forward in terms of quality and value in such a short period of time, I’ve never felt any real connection to any of Hyundai’s product. None of the vehicles I’ve driven have given me ‘the fizz’ as James May would say. That is, until I drove the Genesis sedan a few years ago. That was the first and only Hyundai that I genuinely could see in my driveway. Until now. 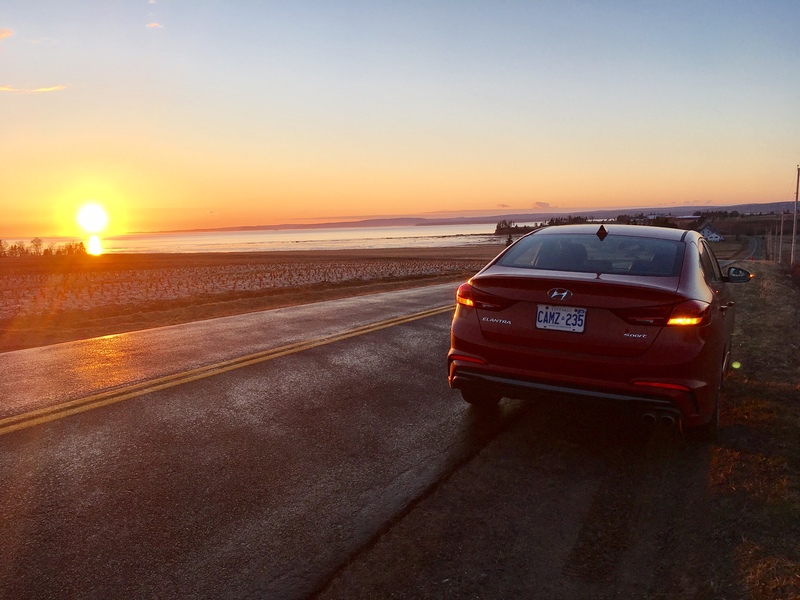 I am walking away from the Hyundai Elantra Sport completely impressed. I’d even go so far as to say that it could be the best vehicle it currently makes. Plenty of standard features; value leader?